Accessing frequently used apps and programs can ease the work but that’s when we have most of the shortcuts easily accessible.Desktop is the most commonly used by many to have the shortcuts, when the shortcuts get out of control then we need to look for alternates, one such way is having a Dock which is light weight and is non obstructive.YzDock is a portable dock which is very easy to use, supports documents, applications etc., and is very similar to the Mac OS Dock. To add items to the dock, just drag and drop the shortcuts onto the dock that’s its you can launch the applications from the dock. To remove the shortcuts from the dock, just drag the icons from the docks outside the docks and the icons is removed. 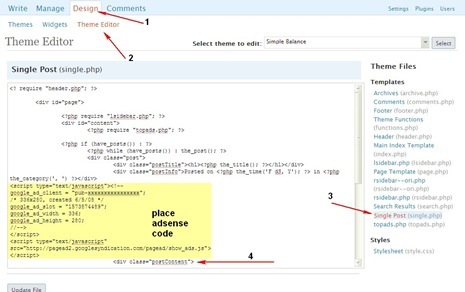 The dock auto hides and shows up only on mouse over on the location where it is set to be visible.The dock can be further customized from its settings window which can be accessed by right clicking on the dock and selecting “ Settings ”. 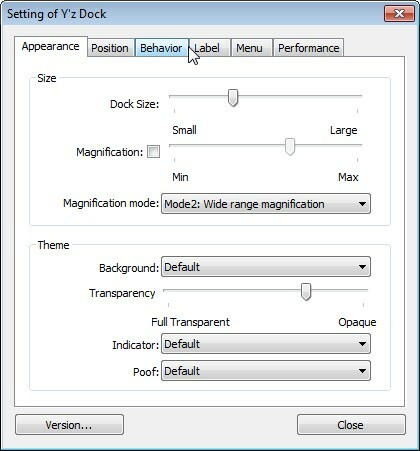 Performance – These settings can be tweaked according to the performance of the dock and your systems configuration. 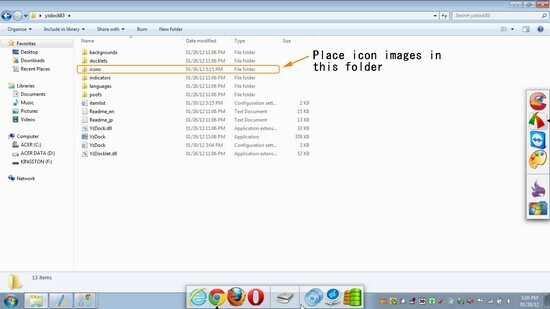 For custom icons for your dock, place the PNG images for your icons in the icons folder in the application folder. Right-click on the icons in the dock, choose ‘ Property of the Dock Item ‘ and select “ Use icons from sub folder ” and click “ Change Icon ” to browse and select a new icon. The dock can be used for having shortcuts to you drives like the Removable Drives, CD/DVD Optical Drives, and Partitions etc.,and frequently used apps.The dock size can be adjusted to accommodate more application shortcuts on the dock.The resulting dock looks like in the image below. Surprised to see 2 Docks, I’ll explain how that possible.YzDock being a portable app and supports running multiple instances, so you can make sure to download the applications 2 times and rename them with different names, and run the YzDock.exe from different folders and set different dock positions positions for each dock and add different set of application as required to each dock.The memory footprint is also very light taking only 1MB for each instance.YzDock is compatible with Windows OS.